When you’ve pledged to commit wholeheartedly to a strict diet and exercise regime, there’s nothing worse than repeatedly caving to hunger pains, reaching for just about every sugary treat available. It’s not you, it’s your ghrelin – a hormone responsible for increasing appetite, which is released in the stomach and signals hunger to the brain. By mixing up your training, minimising stress and using quality supplements, you can curb hunger and stay on track to reach your body transformation goals. The following seven tips will help you fight food cravings and bring your desired physique closer to reality. This one’s logical but all too easily overlooked. You see, rushing meals can actually lead to you eating more since the stomach doesn’t have the necessary time to inform the brain that it’s full. Chewing food slowly and deliberately makes it more likely you’ll eat a sensibly moderate portion. It’s also helpful to avoid distractions while eating, as shovelling forkfuls of food into your mouth can become a mindless, mechanistic process! It’s no longer a secret: high intensity interval training (HIIT) is the most efficient way to burn body fat. Not only is HIIT far more enjoyable than steady-state cardio, but it helps you control your so-called hunger hormone ghrelin, making it less likely you’ll raid the biscuit tin. Think of ghrelin as the main contributor to sweet, salty and fried food cravings, and it’s easy to appreciate the benefits of regulating it. Get started right away with the Adrian James High Intensity Interval Training app and enjoy the dual benefits of quicker fat loss and decreased appetite. Staying on track with the diet is as much about convincing the subconscious as diligently preparing meals and avoiding treats. Next time you get the urge to stray from the diet, nip into the bathroom and brush your teeth. By doing so, the spearmint flavour will hoodwink your mind into believing you ate something. Pretty clever, right? The importance of sleep can never be understated, particularly when it comes to your daily calorie expenditure. Numerous studies indicate that being sleep-deprived motivates us to graze more throughout the day, while also spiking our desire for calorific foods. Aim for 7-8 hours per night and you’ll keep those cravings in check. Ever noticed that you eat more when at a loose end? 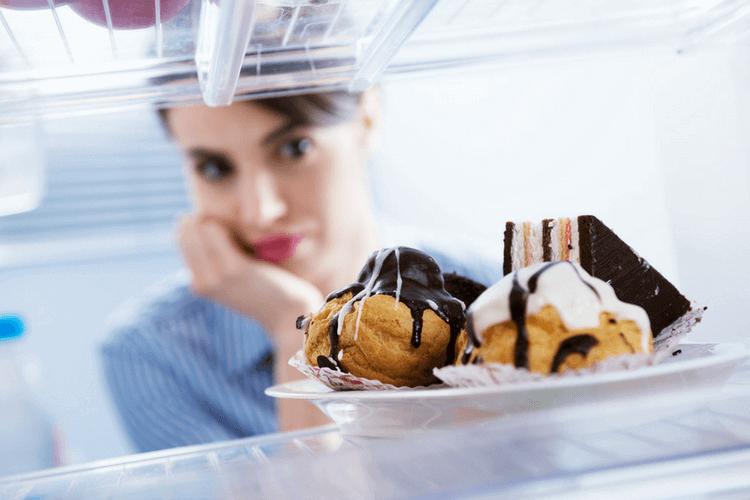 Boredom is one of the most common triggers for binge eating. Avoid falling into this trap by staying busy – working, walking, reading, anything that involves a bit of thought, concentration or physical engagement. Humans are almost hard-wired to eat when they’re riding a rollercoaster of emotions. What’s more, stressful situations lead to eating the wrong kinds of food (jumping in the car to hit the drive-thru or chomping through a whole packet of biscuits while watching Netflix!). Overcome stress with meditation, deep breathing, exercise – whatever you have to do to get back on an even keel. Another proven way to prevent food cravings is to take Thermoblaze. The appetite suppressing weight management supplement includes potent ingredients such as citrus aurantium (bitter orange peel) and L-Tyrosine that help keep hunger pains at bay. The product is a godsend for those who tend to get hungry every couple of hours, and what’s more, several of the ingredients help gently speed up the metabolism. Turn your fat-burning efforts into a veritable inferno with Thermoblaze. Well, there you have it – seven tips to curb cravings and keep on track with your health and fitness regime. Stay consistent with each of these and you’ll achieve your dream physique in record time. No one can refuse from the feature of this video posted at this site, good job, keep it all the time. Asking questions are really pleasant thing if you are not understanding anything completely, except this post presents pleasant understanding yet.